Specific for HIF-2-alpha / EPAS 1. Does not cross react with HIF-1-alpha. Synthetic peptide corresponding to Mouse HIF-2-alpha aa 632-646. CoCl2-treated Cos7 nuclear extract or hypoxic/normoxic PC12 nuclear extracts. Under normoxic conditions HIF-2 alpha has a short half-life. It is largely undetectable in cells or tissues grown under normoxic conditions. It is stabilized only at O2 concentrations below 5% and upon stabilization under hypoxic conditions HIF-2 translocate to the nucleus. Therefore we recommend western blots using nuclear extracts and running Hypoxia treated samples as positive control (ab180880). 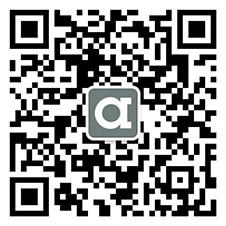 Our Abpromise guarantee covers the use of ab199 in the following tested applications. IP Use at 5-1 µg/mg of lysate. WB 1/200 - 1/1000. Detects a band of approximately 118 kDa (predicted molecular weight: 100 kDa). The following should be taken into consideration: sufficient hypoxia induction is necessary; use nuclear extracts for cleaner results; use positive/negative controls to see which band is up-regulated; HIF2a degrades rapidly (fast sample preparation, protease inhibitors!). Analysis on normoxic and hypoxic nuclear rat cell lysates. ab199 staining human adrenal tissue sections by IHC-P. Sections were PFA fixed and subjected to heat mediated antigen retrieval in citrate buffer (pH 6) prior to blocking in 10% serum for 10 minutes at 25°C. The primary anitbody was diluted 1/500 and incubated with the sample for 1 hour at 25°C. A biotinylated goat anti-rabbit antibody was used as the secondary. HIF-2α levels in HIF-2α−/− and WT mouse kidneys. Nuclear extracts were isolated from harvested whole kidneys using NE-PER Nuclear and Cytoplasmic Extraction Reagents supplemented with Complete Protease Inhibitor Cocktail Tablets. Nuclear protein fractions were electrophoresed on 10% SDS-PAGE under reducing conditions and transferred to a nitrocellulose membrane. Membranes were blocked with LI-COR blocking buffer (LI-COR Biosciences, Lincoln, NE). 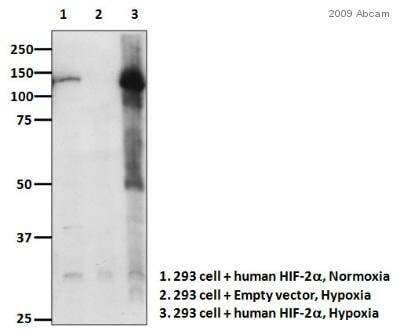 Membranes were then incubated with the same blocking solution containing rabbit polyclonal primary antibodies against HIF-2α (1:500, ab199). After washing, membranes were incubated at room temperature for 1 h in TBS/0.05% Tween 20 buffer with the IRDye800 secondary antibodies (1:10000) and then washed again in TBS/0.05% Tween 20 for 3 times. The blot was visualized using an Odyssey infrared imaging system. All values were normalized to a loading control TATA binding protein (TBP, 1:2000, ab818, Abcam) and expressed as fold increase relative to control. ICC/IF image of ab199 stained HepG2 cells. The cells were 4% PFA fixed (10 min) and then incubated in 1%BSA / 10% normal goat serum / 0.3M glycine in 0.1% PBS-Tween for 1h to permeabilise the cells and block non-specific protein-protein interactions. The cells were then incubated with the antibody (ab199, 1µg/ml) overnight at +4°C. The secondary antibody (green) was Alexa Fluor® 488 goat anti-rabbit IgG (H+L) used at a 1/1000 dilution for 1h. Alexa Fluor® 594 WGA was used to label plasma membranes (red) at a 1/200 dilution for 1h. DAPI was used to stain the cell nuclei (blue) at a concentration of 1.43µM. Lane 1 : 20ug of whole cell lysate from PC12 cells. Lane 2 : 20ug of whole cell lysate from PC12 cells exposed to hypoxic conditions (12 hours at 3% oxygen). Lane 3 : 20ug of whole cell lysate from PC12 cells exposed to hypoxic conditions (12 hours at 3% oxygen) and incubated with antisense HIF2 alpha oligonucleotides 72 hours prior to treatment. The blots were probed with anti-alpha tubulin as a loading control. Parental clear cell renal carcinoma cells (786-O). 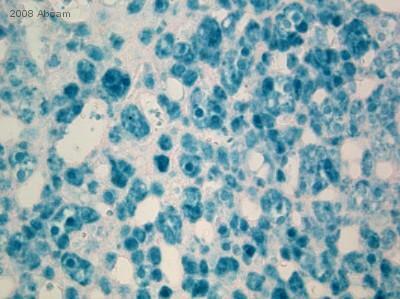 Metastatic clear cell renal carcinoma cells (M1A).